A Glamorous Downtown Sushi Spot. Friends Sushi (www.friendssushi.com) is a great downtown sushi spot. 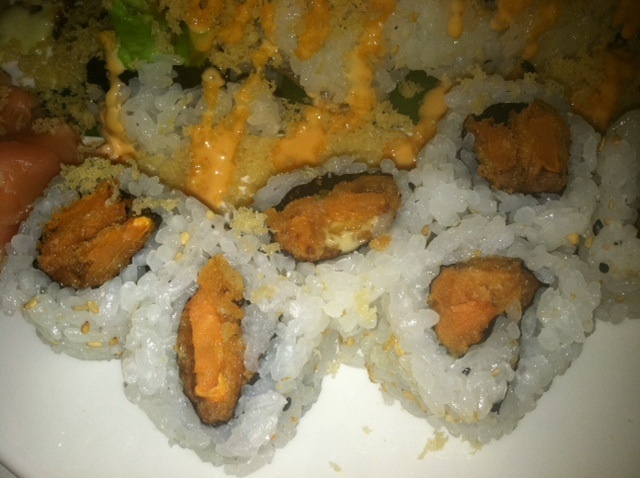 My friend Jenny and I went on a sushi date to Friends Sushi a couple of months ago. It’s on Rush Street right off of Michigan Avenue, but it was surprisingly calm for lunch despite our close proximity to the Magnificent Mile. The interior is quite modern and posh, we felt like we were transported somewhere else. The service was prompt and friendly- go figure! They have a huge menu with tons of different types of creative roles. I highly recommend it if you’re a sushi lover. Vegetable Tempura: Lightly friend sweet potato tempura. This roll is simple, sweet, crunchy and delicious. You can’t go wrong. 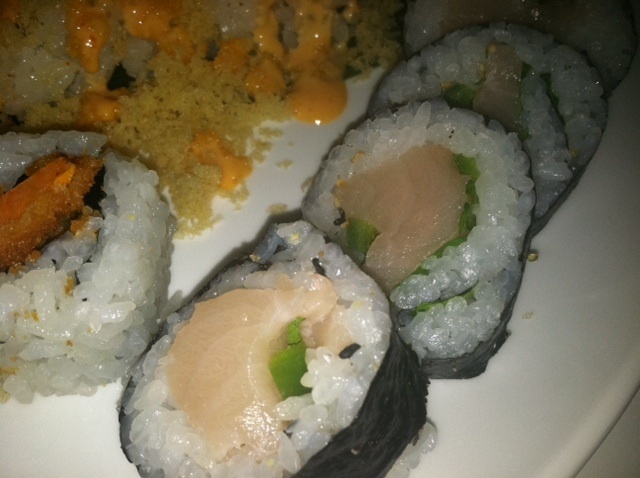 Summer Roll: Yellowtail, jalapeno, cilantro and a touch of lime. This was light and tangy with a bit of heat. My favorite! 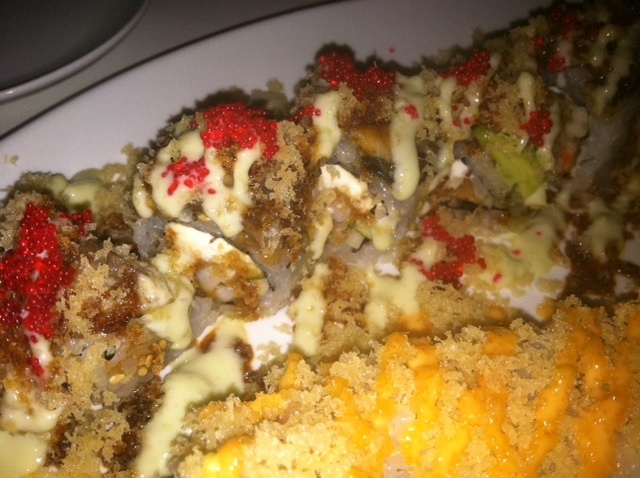 Friends: (top) king crab, shrimp tempura, cream cheese, sriracha sauce, green apple topped with unagi, avocado, tempura crumb, red tobiko, creamy wasabi sauce and unagi glaze. This is their signature role. It’s quite complex with a lot of flavors. It’s definitely a heavier roll, but still really yummy! Crispy Creamy: (bottom) Shrimp tempura, avocado, asparagus, scallion, cream cheese, wasabi tobiko, spicy sauce topped with parmesan cheese, tempura crumb, creamy wasabi sauce and unagi sauce. 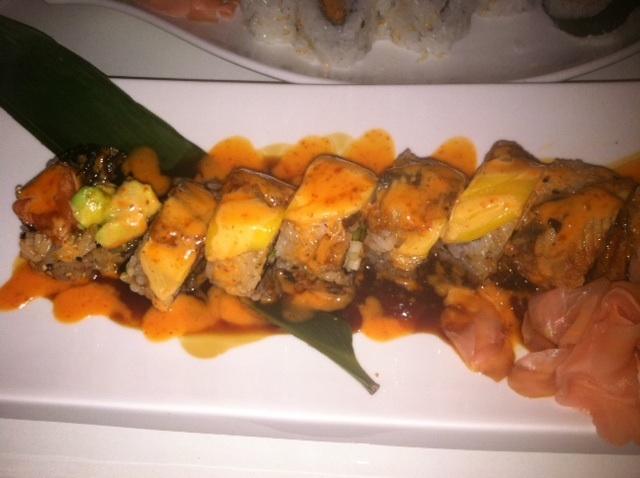 This is another more complex roll but was full of different flavors and textures that all complimented each other very well. 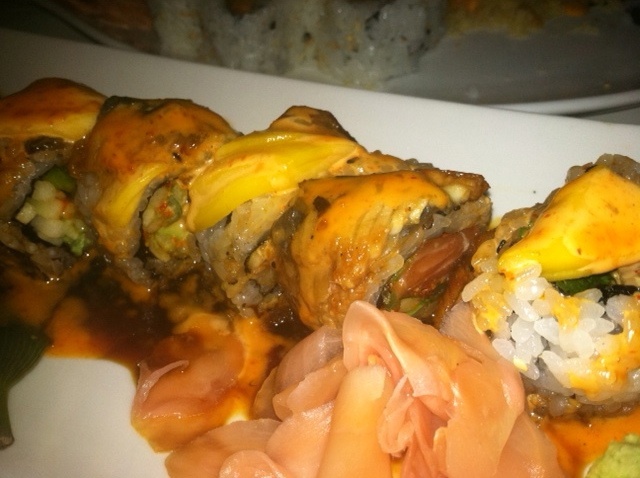 Can you handle it: Salmon, chili oil, avocado, cilantro, jalapeno, spicy sauce, japanese pepper topped with unagi, mango, spicy mayo and unagi sauce. Jenny and I both like spicy foods, so this was a must for us. We loved it! Lots of heat but great tastes, too.